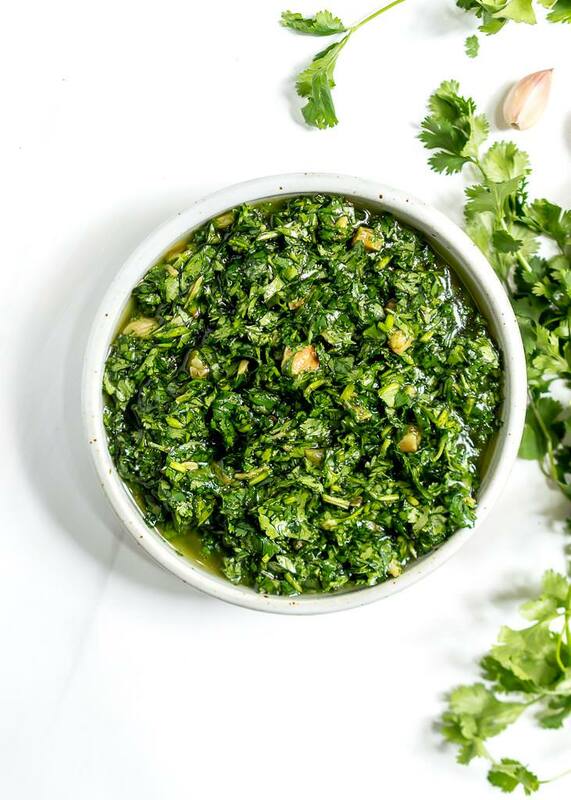 Add a punch of flavor to your favorite Summer grilling recipes with this Roasted Garlic Cilantro Chimichurri Sauce! 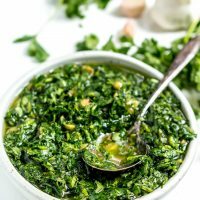 This bright green cilantro chimichurri recipe is fantastic on burgers, chicken, steaks and more. And this is a Whole30 Paleo compliant recipe, gluten free, grain free, vegan and dairy free. Does it get any more gorgeous than this Garlic Cilantro Chimichurri Sauce!?!? I mean, that green color is un-freakin-believable! And this chimichurri tastes as good as it looks. If you like cilantro you are going to love this sauce. If you hate cilantro, well, you’re gonna hate this sauce. But, read the notes below for substitutions. I love this sauce because it is very easy to make and tastes great on just about any type of meat. The sauce does not need to be cooked and you do not need any special tools. Just a sharp knife and cutting board. 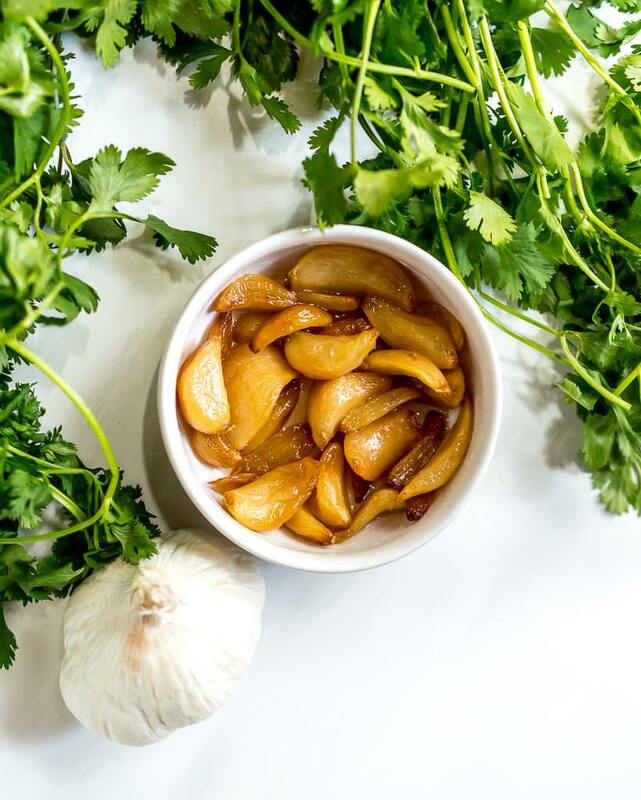 The garlic is roasted before making the sauce but the process is super easy. Check out my tutorial How To Roast Garlic for detailed instructions. What should you serve this cilantro chimichurri sauce with? This sauce it great for most meats like these Baked Turkey Meatballs, Oven Baked Chicken Breast, Skillet Steak, Grilled Sirloin Steak by Lemons for Lulu or Party Wings (recipe coming soon). It also works with veggies like these Oven Roasted Potatoes, Roasted Carrots, Grilled Fajita Vegetable Skewers by A Spicy Perspective or Pressure Cooker Corn on the Cob by Pressure Cooking Today. No problemo. 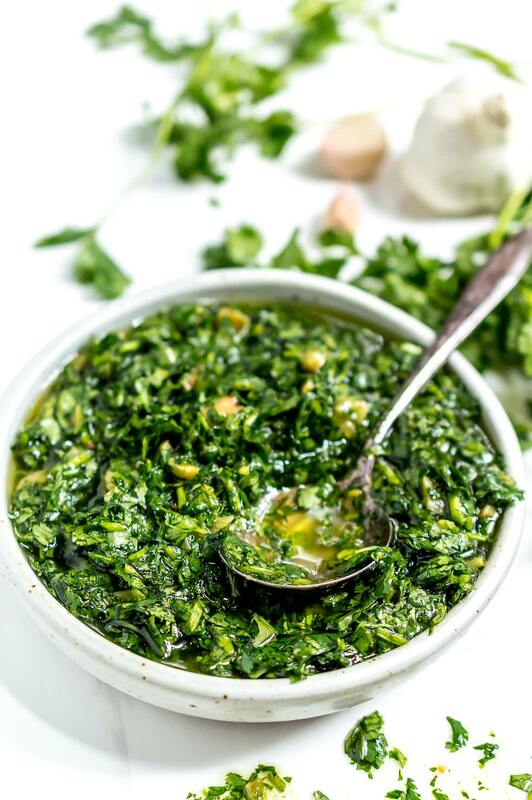 Traditional chimichurri sauce is made with fresh parsley. Feel free to use parsley instead of cilantro for a fresh and flavorful sauce. What if you don’t have time to roast the garlic? You can use raw garlic BUT you will need to use a lot less! Roasted garlic is very mellow compared to raw garlic. If using raw garlic, grate 5-10 cloves into sauce depending on your taste preference. What tools do you need for this chimichurri recipe? You will need a good sharp knife. I use these Chef’s Foundry Ceramic Knives and LOVE them! You will also need a Good Cutting Board. If you are using raw garlic you will need a Microplane for grating the garlic. If you’re getting fancy with it you can use a Garlic Roaster for the garlic. Trim stems from cilantro then finely chop leaves. Chop roasted garlic and add to cilantro. Stir in oil and salt. Serve. Store in refrigerator. Sit at room temperature 30-60 minutes before serving to allow oil to liquify. Thank you Nicole for the nice Wonky bag.